Like an army of foraging ants, those music lovers at Grapefruit Records are building up a collection of box sets that have become a ‘go to’ resource for anyone interested in folk music’s development in the 1960s and 70s. First, there was ‘Dust On The Nettles’ which compiled what was accurately sub-titled ‘A Journey Through The British Underground Folk Scene 1967-72’. Following on from this, their ‘Milk of The Tree’ release was perfectly described in the package’s sub-title as ‘An Anthology of Female Folk Vocal and Singer-Songwriters 1966-73′. 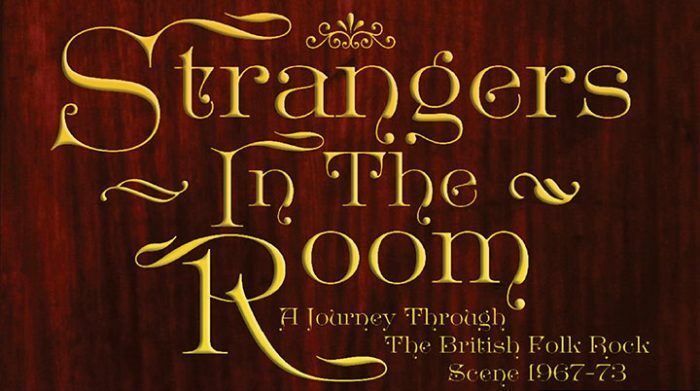 Now, they have released ‘Strangers In The Room’ with, yet again, another perfect sub-title in ‘A Journey Through The British Folk Rock Scene 1966-73’. As before, the new compilation packages 3 CDs in a clamshell box with a comprehensive booklet. The latter describing the sixty songs across forty pages to provide a perfect background to your listening. It’s needed as even a longish review like this cannot reveal all the riches that are to be found here. For those of more advanced years, it provides a nostalgic trip down the memory lane of folk music in that period. For younger listeners, it can help to make the connections between those artists still around and their past influences. A case in point being Michael Chapman’s ‘ Stranger In The Room’ which opens the first CD and gives the collection its title. It’s a track from his ‘Fully Qualified Survivor’ record that perfectly captures the meeting of acoustic and electric music at the heart of folk rock. With the typical attention to detail of these compilations, we’re reminded in the booklet that the electric guitarist on that title track was none other than Mick Ronson who soon found himself working with David Bowie. There are, of course, the familiar names that come to mind when we think of ‘folk rock’ with such as Fairport Convention, The Strawbs, Pentangle and Steeleye Span. Grapefruit Records take the opportunity to unearth rarities when they can which will endear fans to this folk rock collection. For example, Fairport Convention’s ‘Sir Patrick Spens’ is a version with Sandy Denny on vocals rather than the one that appeared on ‘Full House’ where Dave Swarbrick takes the lead. There are other arrangements of traditional folk song with ‘Just As The Tide Was A-Flowing’ from Shirley Collins and The Albion Country Band. However, American influences are scattered around this collection too. Most obviously with Matthews Southern Comfort’s version of ‘Woodstock’ but also in less well well known gems such as Unicorn’s gentle interpretation of Neil Young’s ‘I’ve Loved Her So Long’. Also, there are several songwriters in this collection that are found at the start of their career with early recordings from Joan Armatrading, Steve Tilston, Harvey Andrews, Bridget St John and Alan Hull. The latter represented by yet another rarity with an early solo version of ‘We Can Swing Together’ predating the version he made famous with Lindisfarne. In this same period, Bob Dylan’s picking up of an electric guitar was seen as an act of betrayal by more conservative folkies. However, the quality of the music on the ‘Strangers In The Room’ collection shows just why those fans got it all wrong. Whilst the history of rock music has already told us that this viewpoint wasn’t true, it’s good to have the evidence packaged up into one collection as we have here.